The Jackson 5’s third Motown single “The Love You Save” hits #1 on the Billboard Hot 100 for 2 weeks (6 weeks on the R&B chart) knocking The Beatles off of the top of the chart for the second time in two months. They become the first act in Billboard chart history to have their first three chart entries go to number one. It is also a record that they would shatter again just one week shy of four months later, when the follow up single “I’ll Be There” topped charts in October. Prince’s 28th album “Musicology” is certified platinum by the RIAA. Part of the album’s sales and chart success was due in part to the artists’ unique marketing of it. All fans that purchased tickets to Prince’s “Musicology Tour” received a copy of the CD which was included in the price of a concert ticket. Billboard Magazine even changed their chart methodology so that these sales would be included in their weekly tabulation of album sales through Soundscan. 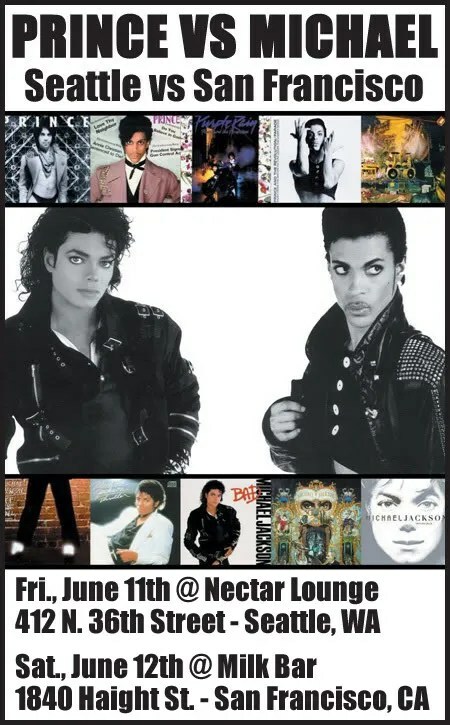 As a result of this clever marketing technique, “Musicology” became Prince’s biggest selling album since “Diamonds And Pearls” 13 years before. The album would eventually go double platinum by January of 2005. Here’s some footage from The Prince vs Michael Experience that took place on 6/11/10 in Seattle. This is what it looked like on stage when we played Black or White. Over his 30 plus year career, Prince has established himself as a virtuoso musician who has mastered many different musical instruments – bass, drums, keyboards, etc. First and foremost, he is most closely associated with the guitar. Out of all of the guitars this master musician has been seen playing over the years, none is more closely associated with Prince than his blonde Hohner Telecaster. Though it is a lower priced copy of the venerable Fender Telecaster, this iconic instrument has been “the man’s” first choice axe since he acquired it back in 1980. Its distinctive and funky tone has been a cornerstone of Prince’s onstage and in studio work since then. Prince is said to be so fond of this particular guitar, that he owns at least 3 or 4 of them. Famous guitar maker Roger Sadowsky was commissioned in 1984 to build two copies of this instrument for Prince to use on the “Purple Rain Tour”. Over the years these guitars have seen so much use that they have been refretted numerous times and a couple of them have even had to have replacement necks made for them! Though any guitar sounds great in this man’s hands, that blonde Tele copy has always been at the root of Prince’s funk. Of the many iconic images Michael Jackson is known for, none is more instantly recognizable than the single white sequined glove he wore when he performed. For many years people saw the glove as just a stage prop, and the other question many had was, “why just one glove?” It turns out the glove served more than just a way to show of Michael’s love for glitz and glitter. According to Jackson family friend, actress Cicely Tyson told CNN anchor Don Lemon that she and Michael used to share the same clothing designer in the 80’s. This particular designer made the first sequined glove (hand sewn with over a thousand sequins) that Michael wore. The glove was actually created to cover Michael’s vitiligo, a skin disease that causes the person to lose skin pigment in large patches all over their body. When Michael’s skin condition was first diagnosed in the early 80’s, it had initially appeared on his left hand. Over the last two and a half decades, MJ’s single white glove has taken on iconic status much like the man himself, it is a surprising twist to discover that in its origin was a simpler and more basic purpose. Prince vs Michael weekend goes down again this year. Friday, June 11th in Seattle at Nectar Lounge and Saturday, June 12th in San Francisco at Milk Bar.